Around Basin Electric, he’s known as the building superintendent. But Dan Job has another title. In the North Dakota National Guard, he’s Command Sergeant Major Dan Job. During the last week, Dan flew with Major General David Sprynczynatyk to Djibouti, Africa, and Kosovo, to check in with two North Dakota National Guard units. The mission was kept secret until their return. While he was overseas, Dan visited with three Basin Electric employees who are serving. Kelby Hovey, Basin Electric pilot, is serving in Djibouti. Basin Electric business analyst Kim Miller and Dakota Gasification Company warehouse supervisor Jill Thomas are serving in Kosovo. 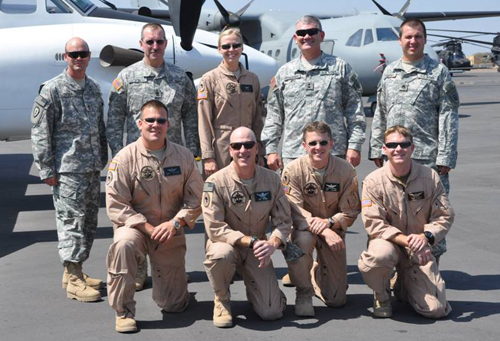 North Dakota National Guard unit serving in Djibouti, Africa. (from left) BEPC employee Dan Job, BEPC employee Kelby Hovey, ND National Guard Major General David Sprynczynatyk. In Djibouti, the soldiers are flying C-12 fixed wing aircraft, transporting personnel, supplies and doing some medivac for several countries located in the horn of Africa. In Kosovo, 650 soldiers are conducting a peacekeeping mission. Over the coming weeks, we’ll run several stories about the Basin Electric employees who are serving with the National Guard. And the Jan/Feb 2010 edition of Basin Today will carry a full story. Thanks Dan, for all you do and thanks to the other soldiers at Basin Electric and its facilities.